Businesses that need a solution that will help them manage, update, and share brand assets and document templates can look to Templafy for some help. Templafy can be easily controlled by a business' Communications and Compliance teams, while at the same time be easy to use for employees and easy to monitor for IT teams. Templafy integrates with a company’s document templates and office apps to more efficiently create documents and presentations. With Templafy, companies can maintain a consistent look across different communication materials, whether it is presentations, contracts, letters, or emails. Managing content and digital assets are also simplified by Templafy. With the software, administrators can put document templates together in one location and update it from there. Any existing digital asset management software companies can be integrated seamlessly with Templafy, allowing any previously approved content and templates to appear in the Templafy task pane that will be present in their office applications. Global B2B brands like Maersk, SDC, and Capgemini use Templafy and find it convenient, especially because it adapts to the needs of businesses, whatever size it may be or whatever industry it is in. Whether it is the human resource department, IT department, legal department, sales and marketing department, or administration, Templafy makes sure documents are consistent with the latest company content. With Templafy, marketing managers can instantly update brand assets and document templates, even without the assistance of the IT team. Employees can increase their productivity as Templafy takes best practices and uses it to streamline document creation workflows. Finally, IT teams can easily introduce a document template strategy that the whole company can adopt. This template will even be accessible across multiple operating systems, browsers, devices, and apps. Templafy provides all the tools needed to come up with a document that follows the guidelines of the company and follows best practices. Templafy using its task pane easily integrates with any digital asset management software the company may already have so importing already approved digital assets into the company’s office applications is quick and easy. Automated workflows also increase productivity as creating documents like contracts, memorandums, and quotes can be done quickly. With personal profiles, users can come up with professional documents already populated with their personal information. Multiple personal profiles can also be set up in case the user is creating a document for management or working from different offices. Templafy improves a company’s document management strategies by understanding what their employees need and analyzing popular templates. Features are also available to ensure that documents follow brand guidelines, and the correct files can be retrieved thanks to the intuitive search functions. 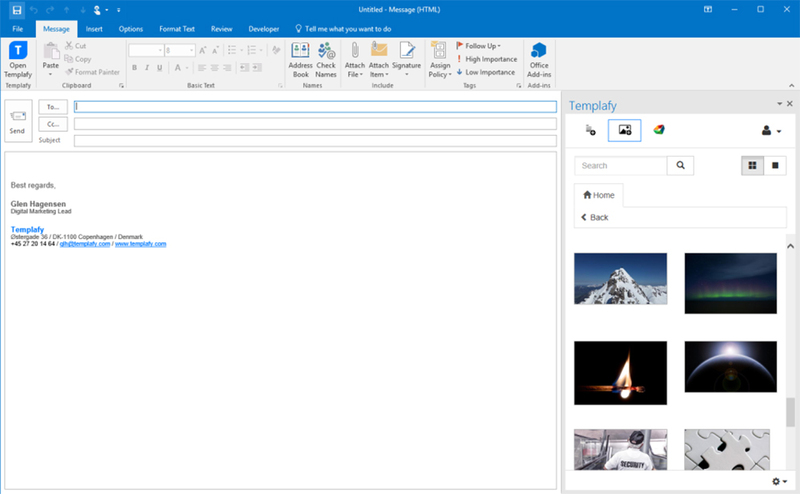 Templafy easily integrates with popular document apps like Google Docs, MS Office, and Sharepoint, so business documents can be easily created without switching from the office suite currently in use. Users can even further speed up document creation by installing add-ons. With Templafy, companies can ensure that employees can create work that is professional looking and uses template designs that are company-approved. The app has a brand checker tool that tells users if any elements of the document do not follow company guidelines and offer suggestions on how to make it comply. With Templafy, companies can be assured that all documents that go out comply with the current company look. Templafy also offers companies a library of email templates that ensures users’ email signature is on-brand and with the correct contact information. Users can even switch between languages, locations, and brands as multiple email signature profiles can be made. Companies who use Templafy can be assured that their employees can work on their documents anywhere, at any time. Because it is a cloud solution, employees can access their work, whether it’s on a smartphone, a desktop, or a tablet. All files are updated in real time, thanks to remote compatibility and centralized location. Templafy keeps all company information secure and can easily integrate with the authentication service the company is using, whether it is OpenID Connect, ADFS, or AzureID. Authorization is required for access, and permission levels can be set across an organization. Access can be divided into individuals, teams, or department. Templafy also only saves templates made by the user, with proprietary content either saved on local storage or in the user’s own cloud. Templates can be easily implemented company-wide as brand assets are centralized. Updates can be immediately updated and employees can be quickly notified of it by email. Storage in the cloud also gets rid of installation or offline synchronization, as files are saved and updated in real time. Getting started on Templafy is quick and easy as it can be done in just four steps. Users simply need to click profile, language, logo, and platform setting and the files go live. The software implements the legal and visual standards set by administrators, so all users need to do is choose a template and put in all the relevant data. Because Templafy works across all devices, it is easy to migrate document templates. Templafy also easily adapts to cloud platforms, so deciding to transfer document templates to Google Drive or Office 365 will be no problem. Templafy also easily integrates with different platforms and business apps, such as Google Drive, SharePoint, One Drive, and Microsoft Office. It can be tweaked to meet any language, legal, location, or design needs the user has. A corporate look can even be applied to the UI.